Patrice Gopo has overcome many challenges life has thrown her way. In the world we live in today, many find it hard to find their voice in the society that has been created. 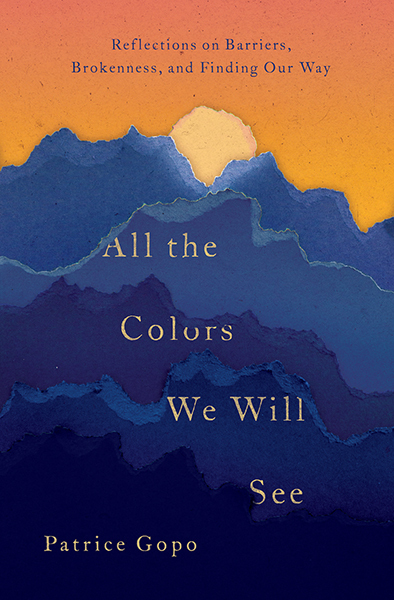 Patrice sits down with Sheen to share how she’s found her own identity, her goal to help others find theirs, and what you can expect to see in her upcoming book, All The Colors We Will See. My name is Patrice Gopo and I am the black daughter of Jamaican immigrants. I was born and raised in Anchorage, Alaska. At this season of my life, I live in Charlotte, North Carolina and I am working as a writer. I do have a background in chemical engineering, nonprofit management, and community development. Do you mind giving us insight into All The Colors We Will See? So, like I said, I am a black daughter of Jamaican immigrants who was born and raised in Alaska and so All The Colors We Will See is an essay collection about what it is to be a black woman in our society where we are very intent on classifying people and defining experiences based on skin color. I write about what it means when your family is a black family but may not have the typical narrative that we often offer black Americans in this country. I write about what it means to try and search for where you might fit in society if you may have grown up in a predominantly white community. The book is a lot about examining what does it means to be a black American and it dives into immigration experiences. With my parents’ family coming from Jamaican, it deals with racial justice issues, so one of the longer essays in the book actually explores what it’s like living here in Charlotte, North Carolina in the aftermath of the Charleston Massacre. I really feel like this book, through this book are touching on a lot of topics and themes that are very current and present in our society right now. What is it that you want your readers to take away from reading All The Colors We Will See? One of the big things I want my readers to take away is this idea that brokenness exists in our society. There are broken aspects in our society and that in fact, impacts some people more acutely than it impacts other people. I feel like we may have similar experiences or we may be able to identify moments where we don’t belong or we feel kind of on the outside but I would argue that through the book, I make the point that this is not the same for everyone. I think people of color, people with immigration experiences may experience those feelings more acutely. That’s one thing I would love people to take away. I think another thing I would hope people would take away, especially people who have experiences like myself. So maybe they are a black woman, a person of color, or maybe their parents came from another country. Maybe they’ll read this book and they will see affirmations of themselves there, that they’ll see someone who is reflecting on their own experiences and their own stories. I think this is very powerful because it says in that act of reflecting back on your story that your story is important and it matters. I also hope that for readers who may not have experiences like mine, maybe they’re not a person of color that they will read this book and they will see points of connection in terms of the shared human experience and that those points of connection would actually be the thing that allows them to enter into something new about my story that they haven’t known before, understand before, or haven’t realized before. Faith has a huge role in your life; can you tell us about how it’s helped you find your identity? I would say for me, the big role that my faith has played is that it has invited me to see myself as made to be exactly who I am. I think that is true for all of us. Society can create these situations where we feel like we may fit best in some places or we look better a certain way, just these different kind of ways that people want to change who they are. I feel like with my faith, it’s a way to actually celebrate the person that I am. That for me has really been a gift in this journey of figuring out where my place is. It’s to say actually, I’m not trying to be like everyone else, that this black woman, who is a child of Jamaican immigrants, who has this multi-cultural heritage is exactly who I am and that this is good. What can we expect to see fro you in the future? One of the big things that I’m working on right now is empowering other people to identify their own personal stories. I feel like through All The Colors We Will See is sharing my own personal stories about my family, my interaction with injustice, about my search for belonging and I believe that we have stories to share. You don’t have to be a writer to identify stories but I believe the power of recognizing our story and sharing those with others can go a long way in terms of building bridges and helping us understand one another better. So, I’m starting to do a bit more teaching and speaking about empowering other people to identify their stories. I also anticipate this book opening up conversation and dialogue. Several of my events through the fall will include public discussions about race and friendship. I plan to continue creating spaces for people to share stories and have discussions related to topics in the book. For more information on Patrice Gopo, click here!